For applications where small products need to be transferred from one conveyor to another, our Series 1500 Tight Transfer Conveyor shines. Featuring nose diameters as small as ¼” and a solid Nyloil-FG® dead plate, the Series 1500 transfers the tiniest of items without disturbing orientation. In addition to being used to bridge the gap between conveyors with larger sprocket or pulley diameters, these units are commonly used for tight transfers into or out of freezers, ovens or other process equipment. 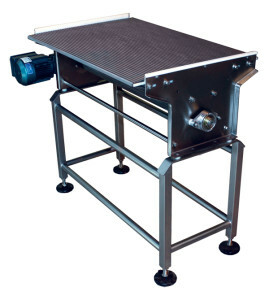 These tight transfer units can be designed as stand-alone conveyors in a variety of lengths and widths, or can be “jumper-driven” from the drive end of a conveyor via chain and sprockets. Depending on the application, a variety of belts are suitable, including fabric based urethane, stainless steel and molded plastic. For more information or to request a quote, please contact us at anytime.